UCSC Spanish Language lecturer María Victoria González-Pagani has been awarded the IV Cristóbal de Villalón Award for "Innovation in Teaching Spanish as a Foreign Language." The honor was granted by the Jorge Guillén Foundation, the Cervantes Institute, and the Miguel Delibes Endowed Chair. Her work was selected from among 30 submissions from a variety of countries--including England, Switzerland, Germany, Brazil, Canada, Slovakia, Italy, Argentina, Spain and the United States. González-Pagani's work submitted for the award consisted of a portfolio of some of the materials she developed and uses in the classes she teaches at UCSC. 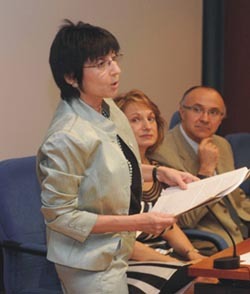 The evaluation committee was chaired by Humberto López Morales from the Royal Academy of Spanish and secretary of the Spanish Language Academies, and included specialists from the Cervantes Institute, the European Association of Teachers of Spanish, the University of Valladolid, and the Diputación of Valladolid.